Sometimes I don’t know how I don’t think of these things sooner. If you’re like me, you’ve spent many hours taking inventory of your house before you run out for a shopping trip. Say it’s the grocery store. You look in the pantry, you grab the pen and paper, and start making that list. Because, you know… you don’t want to buy things you don’t need, and you don’t want to forget why you’re there. But then the dog is barking to be let out, the phone rings, the kids can’t find something, and you’re like “if we don’t leave now, we’ll never get to the store!” So you hurry to the store and guess what’s not there? 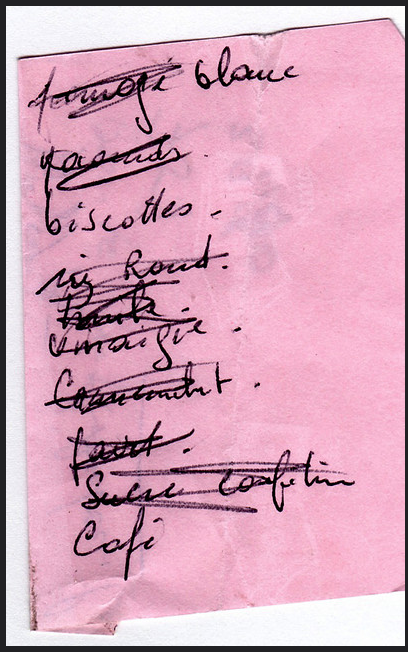 The grocery list. Then, you close your eyes really tightly and start mumbling to yourself in your best attempt to summon a memory of the items on the list. When you get home, the item you needed most, the whole reason you were going to the store, escaped your memory, and is now there, mocking you from the grocery list on the counter. Sigh. A couple weeks ago I was walking to the office to look for the grocery list and it hit me. You know what I never forget to take to the store with me (well, hardly ever forget)? My cell phone! You know what my cell phone comes with? A “notes” feature! And my cell phone is also connected to my tablet, and to the same notes feature! 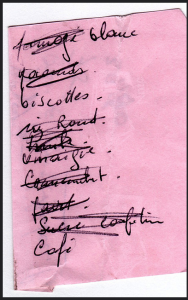 I could type my grocery list out on my notes app from my phone or my tablet and just take that to the store! Brilliant. Late, but brilliant. I haven’t written a paper list since, and I haven’t forgotten an item at the store either. I’ll also be saving a little bit of money on those cute “to do list” pads. If you’ve already thought of this, kudos! If not, feel free to take this idea and run with it. Happy shopping!